A waffle maker is a necessary appliance in any kitchen. The advantages of having your iron that can bake delicious waffles with perfection are too many. You can experiment a lot with these waffles, make them in different ways to suit your mood and taste, make your friend and family feel pampered with a scrumptious breakfast now and then, and above all, you can make some healthy food choices for you and your family. Although a waffle maker makes your life easy and helps to prepare some mouthwatering waffles in no time still some may feel uncomfortable with the nonstick coating on its plates. Since the recent studies reveal how nonstick coating can be a serious health hazard, the popularity of nonstick wares has been dwindling. This is because of the presence of a chemical Teflon in the nonstick coating. What is Teflon and how is it a health hazard? Not all, but most of the nonstick coatings have Teflon in them. Many of our kitchen appliances and cookware used to have a nonstick coating which is favored due to many reasons, but now people are more concerned about the dangers of having a Teflon coating. Teflon is a chemical which is based on the formula PTFE and PFOA. It is not yet proven that Teflon is an actual health risk, but still, people are skeptical about its possible health hazards. Normally, Teflon coating is safe and does not affect food, but the danger arises in overheating. Once the temperature crosses 300 C the nonstick coating of Teflon starts to breakdown and release toxic chemicals in air contaminating the food. Although, options like temperature control and auto shutoff, can prevent overheating but still, people are not comfortable buying Teflon products and would rather buy nonstick appliances. Due to this general public concerns, the manufacturers are making appliances without nonstick coating. Nonstick coating is considered useful only for two reasons. First, it is easy to clean. You don’t need to wrestle with the dry batter just wipe off the surface with a paper towel, and it’s clean and clear. The second benefit of having a nonstick coating is that you don’t need to brush oil on the surface at all for the easy release. The food does not stick to the bottom and is easily released. As we just mentioned, nonstick wares are popular due to easy cleaning and less use of oil. Manufacturers are using ceramic and high-quality stainless steel these days that have the same finish and offers same benefits like nonstick yet without actually using a nonstick coating. Are you looking for a waffle maker without a Teflon coating, and then this article can help you a lot as we have compiled a list of some of the best non-Teflon waffle makers for you. Take a look, and choose one that suits your budget the most. If you are concerned about the nonstick coating on the baking plates of most of the waffle makers, then this one by BELLA is an ideal option. With special ceramic copper titanium coating, this iron bakes 30% faster than the nonstick coating. Beside it is eight times more durable than normal waffle makers are. Its durable coating is more heat resistance. The ceramic coating of the backing plate is PTFE and PFOA free. The iron bakes fluffy Belgian waffles within minutes. 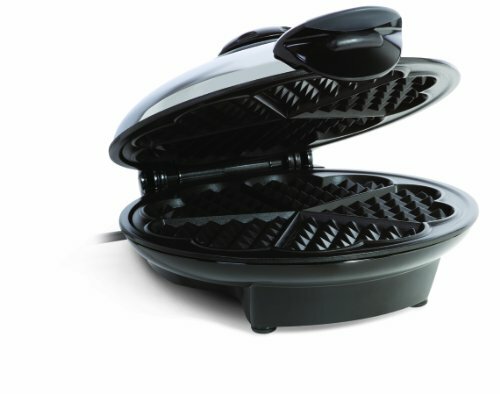 This one is a flip-style waffle maker that allows you to bake even and thick waffles with an even texture. Durable ceramic copper titanium coating. Ceramic baking plates that work better than nonstick. Flip iron bakes waffle with an even texture. Can be stored easily covering less space. Does not offer temperature control. The baking plate is not removable. 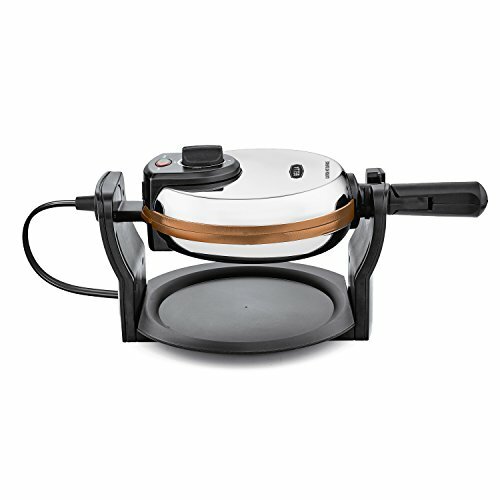 This waffle maker by Euro Cuisine has a nonstick coating that is free of PTFE and PFOA free. The echo friendly coating makes cleaning easy. It makes cute heart shaped waffles that looks great on a platter. The appliance has a durable chromium exterior. It features temperature control that allows you to bake your recipes to the perfection. With vertical storage option, it covers less space and is ideal for small kitchens. The waffle maker offers great value of its price and is an excellent choice for your kitchen. PTFE and PFOA Free nonstick baking plate. Vertical storage covers less space. Offers temperature control for baking waffle as you prefer. Bakes smaller and thinner waffle than Belgian waffles. This waffle iron is also without Teflon coating. It has titanium infused Duraceramic nonstick coating that is PTFE and PFOA free. It is also more durable than Teflon nonstick coating and won’t flake or peel off while cleaning. The iron works 30% faster than another waffle maker. It’s a flip iron that cooks both sides evenly and bakes waffle with the same texture. The iron also comes with temperature control option for giving perfect results and baking your waffle crispy or fluffy as per your choice. Flip iron that bakes waffle with an even texture. 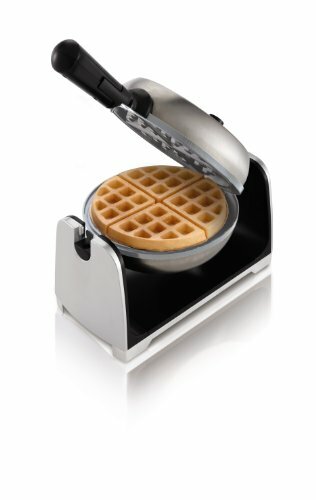 Works 30% fast than other waffle makers. Baking plates are not removable. 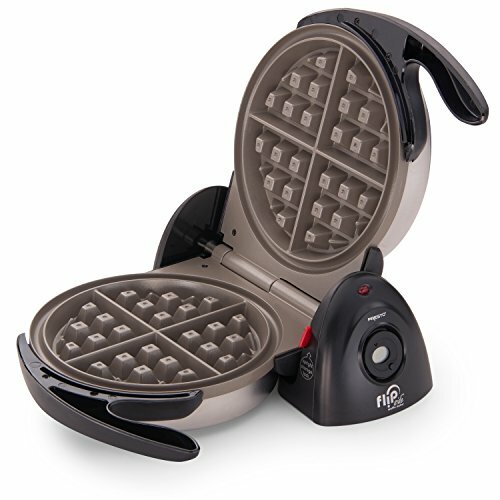 This non Teflon waffle maker is Amazon Refurbished Certified product that is tested and certified. Its extra thick grids bake 7-inch diameter Belgian style waffles that are fluffy and soft. It has a professional rotating design. The iron displays counter timer and digital signals for telling when the waffles are ready. Its ceramic nonstick interior is easy to clean. Bakes 7-inches thick Belgian Waffles. Ceramic nonstick coating on baking plates. Digital signals and counter timer.